Sharing books with your baby is an ideal way to introduce literacy skills and provide a sound basis for learning to read as they grow older. Babies are soothed by familiar voices and are adept at learning new skills even though we may not realise it. Much of a child's capacity to learn is developed in the first three years of life. Studies have shown that children who experience reading aloud from infancy are far more likely to be successful readers as they grow older. And of course, reading with baby allows for enjoyable cuddle time! 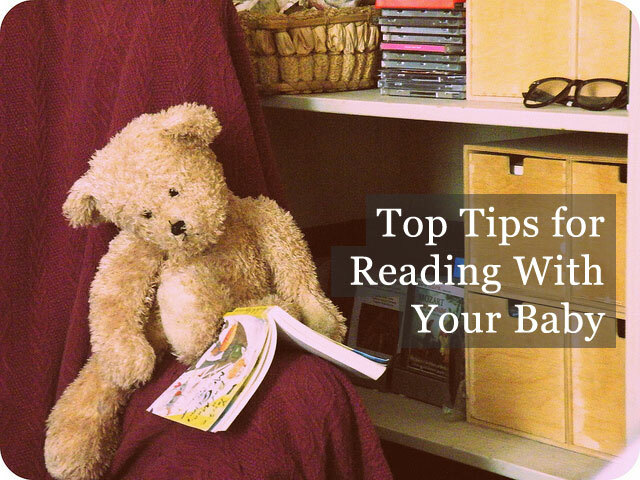 In this post I'll explain some tried and tested tips for reading with babies and toddlers which can help nurture their future enjoyment of the written and spoken word. Rather than "introduce" books as baby develops her sense of the world around her, ensure books are around and available from the get-go. While a young baby may not understand that Mummy is reading a book, she will become familiar with the concept if she sees you reading, or has a handful of age-appropriate books in her toy collection. You are your child's greatest role model. By demonstrating that reading is a part of everyday life and an experience to be enjoyed, your baby will become curious and eventually begin to model your behaviour. Ideally try to have a couple of books appropriate to the age and development of your little one. Soft books are available for newborn babies, who are naturally attracted to contrasting colours and monochrome pictures of faces. You can find a great range of black and white books for newborns from Amazon or check out your local library to see if you can register your baby for their own library card. At around three months, when baby can reach out, grasp and touch, you may find your little one enjoys tactile books, such as the Ladybird "Baby Touch" range which features a range of textures to stimulate the senses. Books with mirrors are also a good choice since babies enjoy looking at their faces while developing their sense of self. Pop-up and lift-the-flap books are excellent choices for the six-month stage onwards, as are those with rhymes which can be read aloud over and over again. Make appropriate noises or gestures to accompany the pictures, such as animal sounds while enjoying the classic Dear Zoo and expressions to convey different emotions. Interaction is the key element here; the enjoyment of snuggling down with a story comes later on in baby's development. As your child develops, try introducing books about numbers, letters, and other familiar things. Babies feel reassured when they recognise features of their daily life presented in the books they enjoy as "play". Don't just read books - play with them! Demonstrate which way up we hold books, how to turn pages and point to pictures she will recognise while allowing her to grab and play with them; chew the corners or drop them on the floor for you to return to her. In time she'll develop a familiarity with how we use books and will be ready to sit on your lap while you read her favourite lines aloud. You don't need a huge library! While your child may develop a voracious appetite for reading material as she grows older, babies need only a handful of quality books at any stage of their development. Studies show that little ones who enjoy the same books over and over again become more familiar with their words and concepts than those who read many different ones. By toddlerhood, your child may already have a favourite book or two which they want to enjoy with you over and over again. Repetition helps strengthen your little one's sense of recognition; she will be learning more than you can possibly realise as the repetition strengthens the neural pathways in her rapidly developing brain. Establishing a daily routine to include story-time paves the way for lifelong literacy skills. Many parents choose to read with their children at bedtime as part of their sleep routine, but there's no harm in enjoying books at any time of day and enjoy regular cuddle-time sessions. Ideally try to work up to 30 minutes of reading/book play time every day: research suggests this is the optimum time for establishing important literacy skills in the early years of life. Siblings, grandparents and carers can all join in with this activity if you're unable to be present. In most areas you will find additional support for early literacy. At the most basic level, your local library will be able to offer advice and a library card for your little one, though chances are that literacy programs and other resources are available too. Here in the UK, the Bookstart program provides free book packs and helpful advice for babies and young children through health professionals. You can also register online and take part in events at your local library. Dolly Parton's Imagination Library is a wonderful scheme which operates both in the US and UK. Those registered with The Imagination Library receive a free age-appropriate book every month until they are five years old - potentially a library of 60 books in total! Be sure to check the appropriate website for your country to see if the scheme operates in your locality. Your paediatrician or health professional should be able to offer further advice regarding support for early literacy skills. What are your suggestions for reading to babies? We'd love to hear stories about what works for you and your little ones. Do you have any favourite books or wonderful experiences you'd like to share? Please feel free to leave your comments and suggestions below.